The famous book by the Bostonian Reverend William Murray, Adventures in the Wilderness, published in 1869, which narrates his hunting and fishing adventures in the Adirondack Mountains, aroused a growing interest in visiting the area. Winslow Homer, who was a great fishing enthusiast, spent several weeks every year with his brother Charles in the forests of these mountains in New York state after the two became founding members of the North Wood Club, a private game and fishing preserve, in 1886. This northern scenery of deserted forests and lakes and rivers of matchless beauty inspired him to paint nearly a hundred magnificent watercolour pictures capturing fishing and deer hunting scenes as well as the devastating effects of the timber industry on forests. 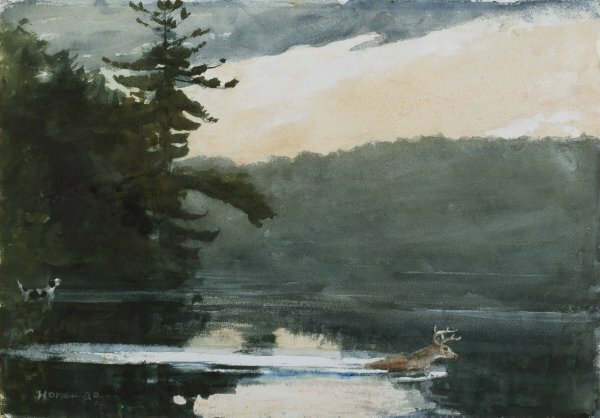 In Deer in the Adirondacks, Homer masterfully conveys the spot’s silent calm that is disturbed only by the presence of a deer swimming through the tranquil waters and a dog steering the prey towards the hunter from the opposite bank. As David Tatham states, deer hunting was a recurrent theme in Homer’s watercolours between 1889 and 1892. Painted entirely outdoors, they show different moments in the characteristic manner of hunting down deer using dogs. According to this practice, which is forbidden today, the dog would drive the deer into the water, where the hunters awaited it in a boat. Although humans occasionally feature in the paintings in this series, the main subjects are always the natural inhabitants of the forests. The work was part of a set of over thirty watercolours that were bought by the famous Boston collector Edward W. Hooper in 1890 and remained in his family’s possession until 1978.